Samuel Isaac Weissman, a professor and chemist who helped develop the first atomic bomb as part of the Manhattan Project, has died, his wife said Friday. He was 94. Weissman died Tuesday in St. Louis. His wife, Jane Loevinger, said a cause of death was not known. Weissman's work with lasers and resonant energy transfer methods at the University of California at Berkeley was cut short when he became one of the first scientists to arrive in Los Alamos, N.M., to work on the Manhattan Project during World War II. The innate immune response is the body's first line of defense against pathogen infection. Dr. Xin Li (University of British Columbia) and colleagues report that three proteins work together in the MOS4-associated complex (MAC) to execute innate immunity in the mustard weed, Arabidopsis. At some level, all types of matter that we usually deal with have at least one thing in common - they're made of particles. The solids, liquids, gases and plasmas that surround us are built of atoms, which are made of electrons, protons and neutrons. Protons and neutrons in turn are made of quarks. 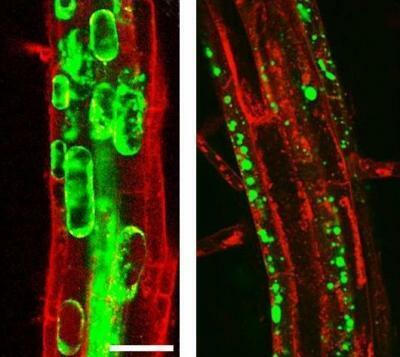 A method for increasing plants’ tolerance to salt stress and thus preventing stunted growth and even plant death has been developed. The method has significant consequences for dealing with soil salinization, which is an acute problem for a wide range of crops in many regions of the world. Magnified photo at left shows the invasion of heavy oxidation (green bubbles) in the membrane of a wild, stressed, salt-sensitive plant. Physicists of the DZero experiment at the Department of Energy's Fermi National Accelerator Laboratory have discovered a new heavy particle, the Îb(pronounced "zigh sub b") baryon, with a mass of 5.774±0.019 GeV/c2, approximately six times the proton mass. If you've ever thought about running a public company, Sarbanes-Oxley is something you probably dread. Commonly dubbed "The Enron Law", it requires enormous oversight paperwork with the consequence that Chairmen, CEOs and Directors can go to jail if they violate it. A new University of Georgia study finds that the 2002 law has altered the makeup of corporate boards, making them larger and more independent and also had the unintended effect of increasing director pay - by more than 50 percent. Even Nazca booby families don't stay together after the kids leave the nest these days. The Nazca booby is a long-lived seabird found in the Galapagos Islands off the coast of Ecuador.